ARMED AND DANGEROUS. Texas Rangers player charge field to protect fellow players from routy fans rushing the outfielders. PART 2: PILLARTOPOST.ORG’S SALUTE TO MAJOR LEAGUE BASEBALL’S OPENING DAY WEEKEND. 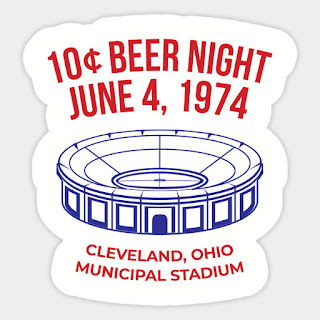 GUEST BLOG / WIKIPEDIA--Ten Cent Beer Night was a promotion held by Major League Baseball's Cleveland Indians during a game against the Texas Rangers at Cleveland Stadium on Tuesday, June 4, 1974. The idea behind the promotion was to attract more fans to the game by offering 12 fluid ounce cups of 3.2% beer for just 10 cents each, a substantial discount on the regular price of 65 cents, with a limit of six beers per purchase but with no limit on the number of purchases made during the game. 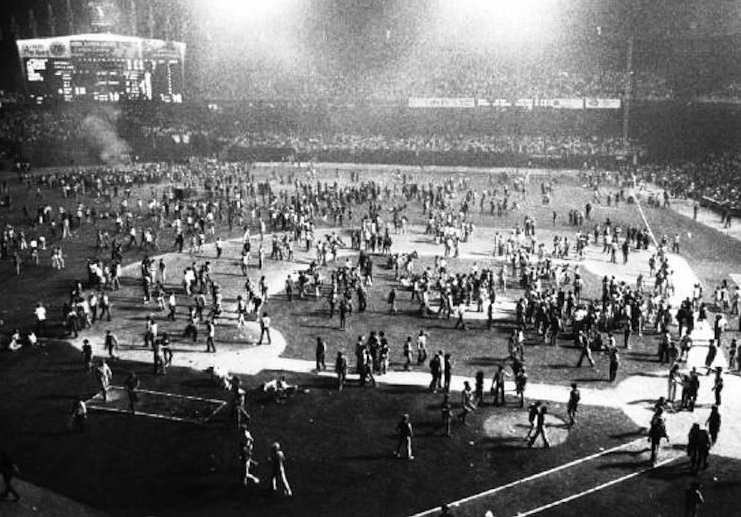 During the game, fans became heavily intoxicated, culminating in a riot in the ninth inning which caused the game to be forfeited due to the crowd's uncontrollable rowdiness and because the game could not be resumed in a timely manner. NBC newscaster, the late Tim Russert, then a student at the Cleveland–Marshall College of Law, attended the game. "I went with $2 in my pocket," recalled the Meet the Press host. "You do the math." 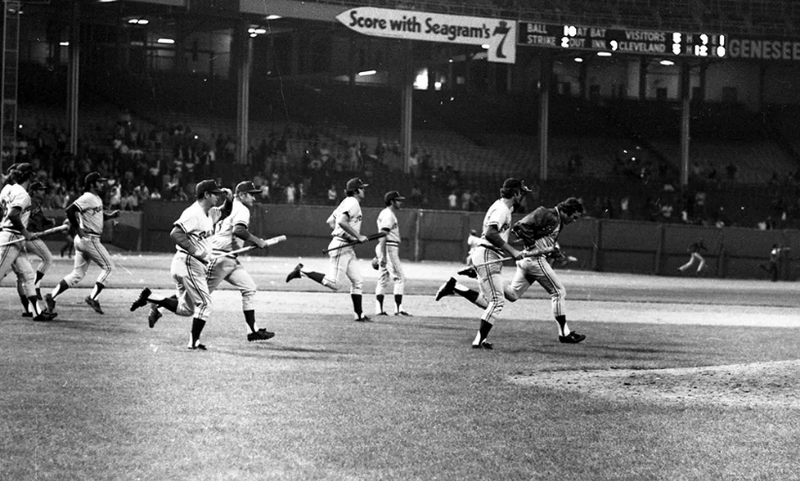 The Indians had previously held such promotions without incident, beginning with Nickel Beer Day in 1971. However, a bench-clearing brawl during the teams' last meeting one week earlier at Arlington Stadium in Texas left some Indians fans harboring a grudge against the Rangers. The Indians retaliated in the bottom of the eighth when pitcher Milt Wilcox threw behind Randle's legs. Randle eventually laid down a bunt. When Wilcox attempted to field it and tag Randle out (which he did successfully), Randle hit him with his forearm. Indians first baseman John Ellis responded by punching Randle, and both benches emptied for a brawl. After the brawl was broken up, as Indians players and coaches were returning to the dugout, they were struck by food and beer hurled by Rangers fans; catcher Dave Duncan (San Diego native/Crawford High) had to be restrained from going into the stands to brawl with fans. The game was not suspended or forfeited, no players from either team were ejected, and the Rangers won 3–0. Cleveland flasher didn't miss an opportunity to join in the riot. After the game, a Cleveland reporter asked Rangers manager Billy Martin "Are you going to take your armor to Cleveland?" to which Martin replied, "Naw, they won't have enough fans there to worry about." During the week leading up to the teams' next meeting in Cleveland, sports radio talk show host Pete Franklin and Indians radio announcer Joe Tait made comments that fueled the fans' animosity toward the Rangers. In addition, the local daily newspaper, The Plain-Dealer, printed a cartoon the day of the game showing team mascot Chief Wahoo holding a pair of boxing gloves with the caption, "Be ready for anything." Problems from the beginning. 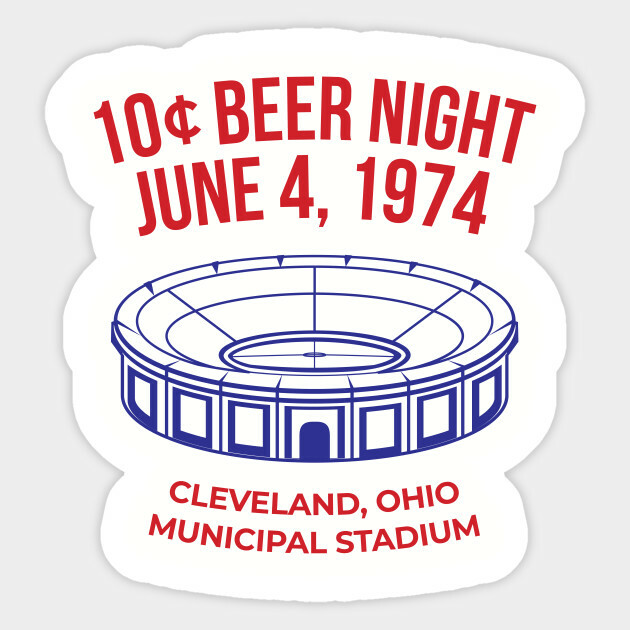 Six days after the brawl in Texas, Cleveland's Ten Cent Beer Night promotion drew 25,134 fans to Cleveland Stadium for the Tuesday night game, twice the number expected. The Rangers quickly took a 5–1 lead. Meanwhile, throughout the game, the inebriated crowd grew more and more unruly. Early in the game, Cleveland's Leron Lee hit a line drive into the stomach of Rangers pitcher Ferguson Jenkins, after which Jenkins dropped to the ground. Fans in the upper deck of the stadium cheered, then chanted "Hit 'em again! Hit 'em again! Harder! Harder!" 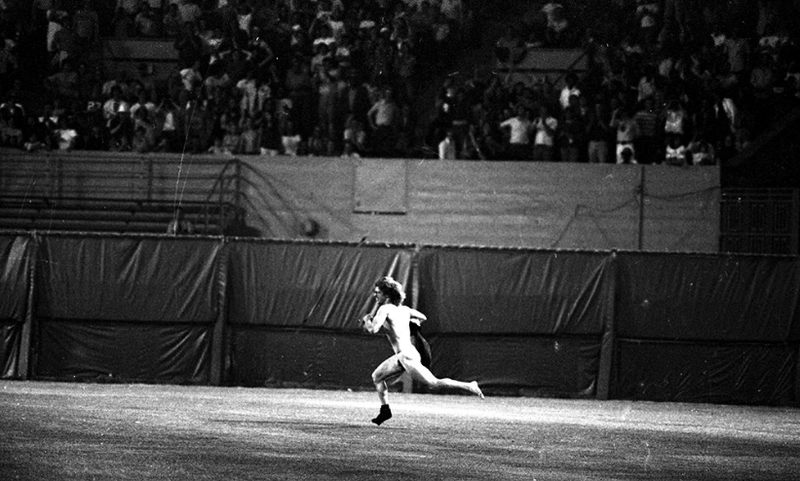 A woman ran out to the Indians' on-deck circle and flashed her breasts, and a naked man sprinted to second base as Grieve hit his second home run of the game. One inning later, a father-and-son pair ran onto the outfield and mooned the fans in the bleachers. As the game progressed, more fans ran onto the field and caused problems. Ranger Mike Hargrove, who would later manage the Indians and lead them to the World Series twice in 1995 and 1997, was pelted with hot dogs and spit, and at one point was nearly struck by an empty gallon jug of Thunderbird. The Rangers later argued a call in which Lee was called safe in a close play at third base, spiking Jenkins with his cleats in the process and forcing him to leave the game. The Rangers' angry response to this call enraged Cleveland fans, who again began throwing objects onto the field. Someone tossed lit firecrackers into the Rangers' bullpen. In the bottom of the ninth, the Indians managed to rally, tying the game 5–5, and had Rusty Torres on second base representing the potential winning run. However, with a crowd that had been drinking heavily for nine innings, the situation finally came to a frothy head. After the Indians had managed to tie the game, a 19-year-old ran onto the field and attempted to steal Texas outfielder Jeff Burroughs' cap. Confronting the fan, Burroughs tripped. 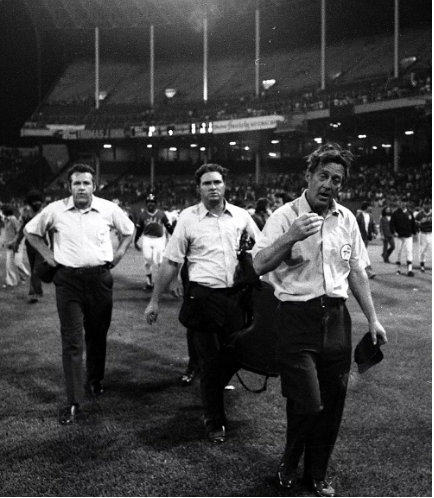 Thinking that Burroughs had been attacked, Texas manager Billy Martin charged onto the field with his players right behind, some wielding bats. A large number of intoxicated fans – some armed with knives, chains, and portions of stadium seats that they had torn apart – surged onto the field, and others hurled bottles from the stands. Hundreds of fans surrounded the outnumbered Rangers. Realizing that the Rangers' lives might be in danger, Cleveland manager Ken Aspromonte ordered his players to grab bats and help the Rangers, attacking the team's own fans in the process. Rioters began throwing steel folding chairs, and Cleveland relief pitcher Tom Hilgendorf was hit in the head by one of them. Hargrove, after subduing one rioter in a fistfight, had to fight another on his way back to the Texas dugout. The two teams retreated off the field through the dugouts in groups, with players protecting each other. The bases were pulled up and stolen and many rioters threw a vast array of objects including cups, rocks, bottles, batteries from radios, hot dogs, popcorn containers, and folding chairs. As a result, umpire crew chief Nestor Chylak, realizing that order would not be restored in a timely fashion, forfeited the game to Texas. He too was a victim of the rioters, as one struck and cut his head with part of a stadium seat and his hand was cut by a thrown rock. He later called the fans "uncontrollable beasts" and stated that he'd never seen anything like what had happened, "except in a zoo". As Joe Tait and Herb Score called the riot live on radio, Score mentioned the security guards' inability to handle the crowd. Tait said, "Aw, this is absolute tragedy." The Cleveland Police Department finally arrived to restore order. Later, Cleveland general manager Phil Seghi blamed the umpires for losing control of the game. The Sporting News wrote that "Seghi's perspective might have been different had he been in Chylak's shoes, in the midst of knife-wielding, bottle-throwing, chair-tossing, fist-swinging drunks." American League president Lee MacPhail commented, "There was no question that beer played a part in the riot." The next Beer Night promotion on July 18 attracted 41,848 fans with beer again selling for 10 cents per cup but with a limit of two cups per person at the reduced price.